Re: How do I identify the early symptoms? Happy New Year dedicated dog or cat owner..
Answer: You will learn this in many ways with My multimedia corse: in video, in print and in audio. Determining the early symptoms of diseases in your pet is based on performing an adequate physical exam. Do not expect to be comfortable doing this in 1 day- but after 2 weeks of practice, then you will be quite skilled at performing a physical exam on your pet. I go through every single part of the physical exam in my At Home Exam DVD. This is a detailed 60 minute DVD. I go through every portion of the physical exam, showing you exactly what to do. 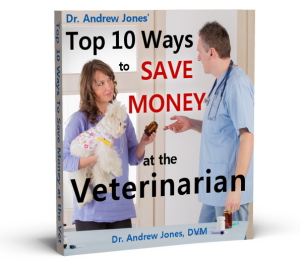 And you can read about the specifics in the Pet Health Manual- Veterinary Secrets Revealed. I include a physical exam worksheet – here you record your findings from the physical exam. After recording your findings, you can then determine if your pet is sick. Keko, my new neighbors dog has a slight limp. He is a 7 month old Collie cross. My neighbor asks me to “check him out”- so these are my steps. First I stand back and watch him – from a distance I can see him limp slightly on the right and left front legs. This tells me that more than one limb is involved. THen I measure Temp, Pulse and Respirations – all are normal. Next I perform a thorough musculoskeletal exam, as shown in Section 5 of the DVD. His joints are not painful. There is nothing in his foot, or any sign of infection. His Lymph nodes are normal size. I research lameness in the index. I read about the causes of lameness, especially in a young dog. I can also listen to the audio sections. I reading about it, I see that a disease called Panosteitis or “Growing Pains” is common in young dogs. It is inflammation around the long bones in rapidly growing young dogs. Anti-oxidants to help with the inflammation. Aspirin – 325mg twice daily for 5 days. Vitamin C – 100mg twice daily. I document all my treatments in the progress sheet, and re-examine and record my findings daily. P.S. “Keko” really did have this problem, and this is how I treated him. Keko responded well and was no longer limping in 7 days. My point is that you could do the exact thing at home with your pet! P.P.S. Plan on being able to detect early symptoms in your pet with my new multimedia course… check it out at? ?www.veterinarysecretsrevealed.com/preview.html.